Dealer Supply Shop is a large online retailer that specializes in banners, signs, flags and other marketing materials. It offers a huge selection of items, many of which come in a wide variety of designs from which you can choose. Spice up your marketing materials with items from Dealer Supply Store. Among the many promotional items found at Dealer Supply Store are fun and eye-catching antenna flags. These miniature antenna flags clip onto car antennas and can be used to announce sales, special features or just to draw attention to vehicles for sale. The flags are easy to clip into place, and they can be removed without damaging the vehicle. 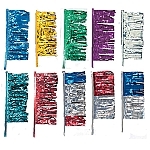 Check out the wide variety of antenna flags, all of which come with customization options so you can personalize them for your lot. Dealer Supply Store is not just a great place to stock up on classic signage for your business; it is also a good source for new ideas that are sure to get your customers talking.